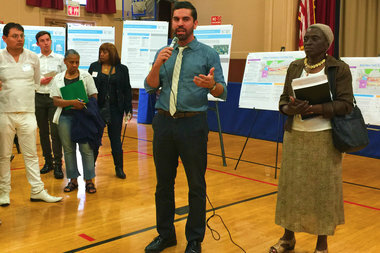 Councilman Rafael Espinal and Councilwoman Inez Barron, who represent East New York and Cypress Hills, addressed residents at a town hall on the neighborhood's rezoning. CYPRESS HILLS — Ongoing town halls and community dialogues on the city’s proposals to rezone East New York have done little to quell the fears and concerns of longtime residents, locals said. Mayor Bill de Blasio’s plan to bring thousands of affordable units to the neighborhood left many residents dissatisfied with the city’s outreach attempts. East New York is the first neighborhood targeted by de Blasio’s administration for zoning changes that would create and help preserve 200,000 affordable units throughout the city. More than 1,200 units are planned for the area over the next two years to serve “low and very low-income households,” according to Carl Weisbrod, director of the Department of City Planning. The city’s Department of Housing Preservation and Development proposed that at least 50 percent of all the housing created in East New York would be affordable to local residents. Councilwoman Inez Barron expressed concern for the other half, saying that 50 percent of a “gentrified class” would come into the community to reap the benefits. In a neighborhood with a median household income of $34,500 a year, the 1,200 promised units would largely serve families earning between $23,000 and $46,000 annually, Weisbrod added. Plans are being shaped and changed through community forums that have spanned over the last 10 months, city officials said. But not all residents have been informed, Lopez said. He heard about Wednesday’s town hall from a neighbor and expressed a desire for the city to reach out directly to populations that will be most impacted — homeowners and low-income individuals. “They need to do a better job in letting people know what’s going on,” Lopez said. Others said talk of affordability and proposals presented for residents' input are “too sanitized” and don’t get to the root of the real issues, according to activist Paul Muhammad. “My major concern is the misuse of a lot of words,” Muhammad said. “The word ‘affordable’ is relative. ‘Sustainable communities’ — a building does not sustain itself, you have to build sustainable people. Muhammad’s family has owned a house on Pitkin Avenue since 1969, he said. His home is located on a corridor of mostly two to three-story residential buildings and row houses, including small businesses on the ground floors. Under proposed zoning, buildings of up to eight stories could be constructed on the avenue. Muhammad has already received multiple calls from individuals looking to buy his property, he added. “This multi-billion dollar project can change the whole face of East New York,” he said. “But it’s a reactive plan to developers, not a proactive plan helping people in the schools and churches and streets. In addition to housing, the city plans to address issues of economic development and community resources with an Industrial Business Zone, the implementation of an Atlantic Avenue safety project, and the construction of a new school in District 19. Any planned changes must first undergo review from the community board and the City Council. “We’ve been working very closely with agencies, keeping in touch to make sure the residents' concerns are being met at the table,” said Councilman Rafael Espinal. Plans will be up for public review in the fall, officials said.